This picture is of Flickr user Sierraromeo's CSA haul because I forgot to take a picture of my own. I mentioned that Nathan and I had joined a local CSA and promised that I would tell y'all more about it. And, since nothing especially blog-worthy has happened this week, now seems as good a time as any. CSA stands for Community Supported Agriculture and it's basically a partnership between a farmer and those people who decide to join the CSA. At the beginning of the season, community members buy shares of the farm with the understanding that every week, we'll be able to pick up fresh, local, organic produce. This is a great deal for everyone involved. Firstly, the price for the share is fixed, which means that even as the supermarket price of a single green pepper skyrockets to $1.59 (true story!) I need not worry - my pepper prices aren't going anywhere. My produce is also local, which is way better for the environment since it only has to travel five miles to get to me, as opposed to being shipped across oceans and/or countries. And being able to lessen my personal dependence on gas and oil - especially in these times of war and global warming - is incredibly important. I get to talk to my farmer every week and volunteer on the farm when I can, giving me an intimate connection to the foods that sustain me. I also get to try new things, since I'd probably never come into possession of a radish unless I found it in my weekly basket. I look at that aspect of CSA's - the fact that I'll never know what, exactly, will end up in my hands - as a positive thing, though I am sure it annoys some people. 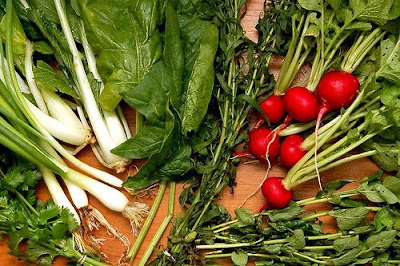 What if you hate radishes and cabbages? What if carrots just ain't your cup of tea? What if you want to personally choose which vegetables you eat and how much of each you receive? In that case, CSA's may not be for you. But for those of us who like to live on the edge, they're just about perfect. Besides being good for my wallet, my health, and my sense of adventure, CSA's are also - and perhaps most importantly - good for farmers. Farming is a risky business, as one bad growing season could affect a farmer's finances and stability for a lifetime. By allowing people to pay up front for their share of the farm, the farmers are ensured an income and can operate without the stress of wondering whether they'll be around next year. Sure, if a drought hits or a tornado tears the crops to shreds I, as a member, will be out a bit of money. But sharing that risk with the other members of the CSA makes it affordable for us, and safe for our farmer.